The states located along the Atlantic coast have been reliant on fossil fuels, which pollute the air, cause various health hazards, and add to global warming. Therefore, these states are adopting an energy system that is run using clean, renewable sources: Atlantic states currently produce sufficient solar and wind energy to power approximately 2 million homes, 19 times more than just ten years ago. To accomplish an accurately clean energy system, Atlantic states – which make up over a quarter of the nation’s energy use – will have to tap into an enormous clean energy resource that is available very close: offshore wind energy. With sufficient wind energy resources to produce four times the amount of electricity the region presently uses, offshore wind can help power the Atlantic coast with clean energy. With the aim of capturing this incredible pollution-free resource, state leaders must formulate strong policies to foster the development of offshore wind, while guaranteeing the protection of oceans and wildlife. Offshore wind is a copious resource positioned close to where the people need it most, and it can play a central role together with other renewable energy sources in providing clean energy for the future. The offshore wind around the Atlantic states could yield sufficient electricity annually to meet four times those states’ electricity consumption (4,574 terawatt hours), even after leaving off areas not appropriate for current technology and prohibited areas like shipping lanes. 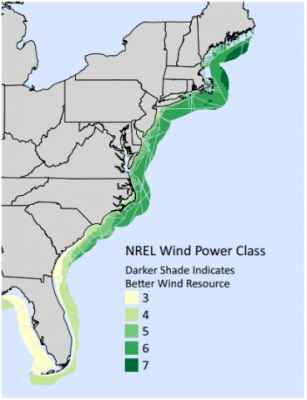 Nearly every Atlantic state (12 out of 14) has wind potential off its shores that surpasses present state electricity consumption. Tapping into offshore wind can help meet future electricity demand shaped by electrifying activities presently powered by natural gas, gasoline, and other fossil fuels, like heating homes and businesses, and transportation. If developed to its maximum potential, Atlantic offshore wind could supply twice the estimated electricity it would take to power all current electricity requirements as well as estimated electricity for electrified heating and electric vehicles. Offshore wind is established. Europe has 4,100 offshore wind turbines that supply adequate electricity to power over 20 million homes daily. In Denmark, offshore wind supplied 15% of electricity use over the first half of 2017. The offshore wind turbine is progressive and can produce more power, more efficiently than ever before. For instance, the turbines at the country’s first offshore wind project in Rhode Island yield 30 times more electricity per annum than the first offshore wind turbines installed in Europe in the early 1990s. Offshore wind has become reasonably priced. According to Lazard, the average worldwide levelized cost of energy for new offshore wind dropped by 27% from 2012 to 2017, to a cost that is comparable to a new coal-fired power plant and low-cost than a new nuclear plant over the plants’ total life cycles. Experts forecast that offshore wind will continue to drop in price. Bloomberg New Energy Finance projects that the levelized cost of energy for offshore wind will drop by 71% by 2040 comparative to today’s prices. Experience abroad and at home has revealed that responsible development of offshore wind can avoid destruction to the wildlife and environment, including the North Atlantic right whale. Over 8 gigawatts of offshore wind development is helped by state policy in five Atlantic states. If state offshore wind targets and commitments are fulfilled, offshore wind in those states would be able to produce electricity equivalent to the power used by 3 million homes. As of February 2018, 13 Atlantic offshore wind projects had leases and were progressing. With a total projected capacity of 14.2 GW, these planned projects could power approximately 5.2 million homes. These in-development offshore wind projects could yield a fifth as much energy as can be gotten yearly from Atlantic offshore oil and gas, based on positive production estimates from the American Petroleum Institute, an industry trade group. The capacity of the planned projects signifies only 1% of Atlantic offshore wind technical potential. Offshore wind has the potential to help repower the Atlantic coast with clean energy – but making the most of the opportunity will need support from regulatory bodies and policymakers. Supportive policies include robust and enforceable state offshore wind targets, policies to guarantee a strong market for offshore wind, investments in research, and efforts to collaborate with the Federal Bureau of Ocean Energy Management to ensure environmentally responsible and efficient development of offshore wind resources. Policymakers must also formulate minimum standards for the safe-keeping of ocean habitats and wildlife (mainly the North Atlantic right whale).